Good old-fashioned image layers are the backbone of the world of layers within Photoshop Elements 11. You can create multiple image layers within a single document. Even more fun is creating a composite from several images. The creative possibilities are endless. In the Photo Editor, in Expert mode, click the Create New Layer icon at the top of the Layers panel. A layer with the default name Layer 1 appears in the Layers panel. In the Photo Editor, in Expert mode, select New Layer from the Layers panel menu (click the down-pointing arrow in the upper-right area of the panel). If you create a layer by using either of the preceding two methods, you open a dialog box in which you name your layer and can specify other options for blending and opacity. Provide a name for your layer and click OK. You should specify the other options directly in the Layers panel later. Paint directly on the layer. Use one of the painting tools, such as the Brush or Pencil. Copy and paste a selection to your layer. 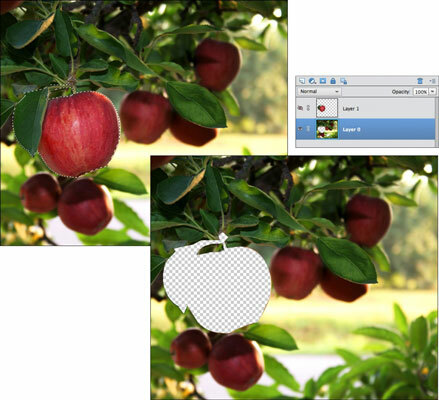 Make a selection on another layer or on the background within the same document or from another image entirely. Then choose Edit→Copy. Select your new, blank layer in the Layers panel and choose Edit→Paste. Cut and paste a selection to your layer. Make a selection on another layer (or on the background) within the same document or from another image and then choose Edit→Cut. Select a new, blank layer and choose Edit→Paste. Just remember that Elements deletes the selection from the source and adds it to your new layer. Transfer an entire image to your new layer. Choose Select→All and then either Edit→Copy or Edit→Cut. Select a new, blank layer and choose Edit→Paste. Another way to create a layer is to use the Layer via Copy command on the Layer menu. Make a selection on a layer or background and choose Layer→New→Layer via Copy. The copied selection is placed on a new layer with the default name Layer 1. You can do the same with the Layer via Cut command, but in this case, Elements cuts, or deletes, the selected area from the source layer or background and places it on the new layer. The source layer is left with a transparent or background-colored hole. You can use these two commands only within the same image. You can’t use them between images. If you want to duplicate an existing layer, first select it in the Layers panel. Then drag the layer to the Create New Layer icon at the top of the Layers panel. You can also duplicate a layer by selecting Duplicate Layer from the Layers panel menu or by choosing Layer→Duplicate Layer. As when you create a new layer, both menu methods prompt you with a dialog box to name your layer and specify other options. Provide a name for your layer and click OK. If you choose the first method, Elements provides the default name of the original layer with the word Copy appended to the name. Duplicating layers can be especially handy when you want to experiment with a special effect but don’t want to harm your original image.